Clearly, these 4 guys from Arizona are insane. 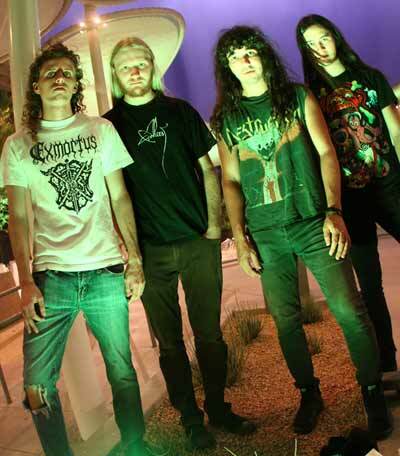 There are a lot of rumors about people from Arizona, but in terms of Metal, I’d never seen anything that crazy. My first encounter with Vektor was the cover of their first record Black Future (although some might say their Demo Nucleus is in fact the first LP). My reaction was “what the hell is this going to sound like??”. And I wasn’t disappointed, as Black Future didn’t sound like anything I’d heard before. This young band genuinely sounded DIFFERENT, really, I had nothing to compare it to. I mean OK; there are some elements here and there. Some might speak about Voivod influences. Yeah, sure, the logos look alike, and they both have Sci-Fi themes. But musically, the comparison is not that obvious. 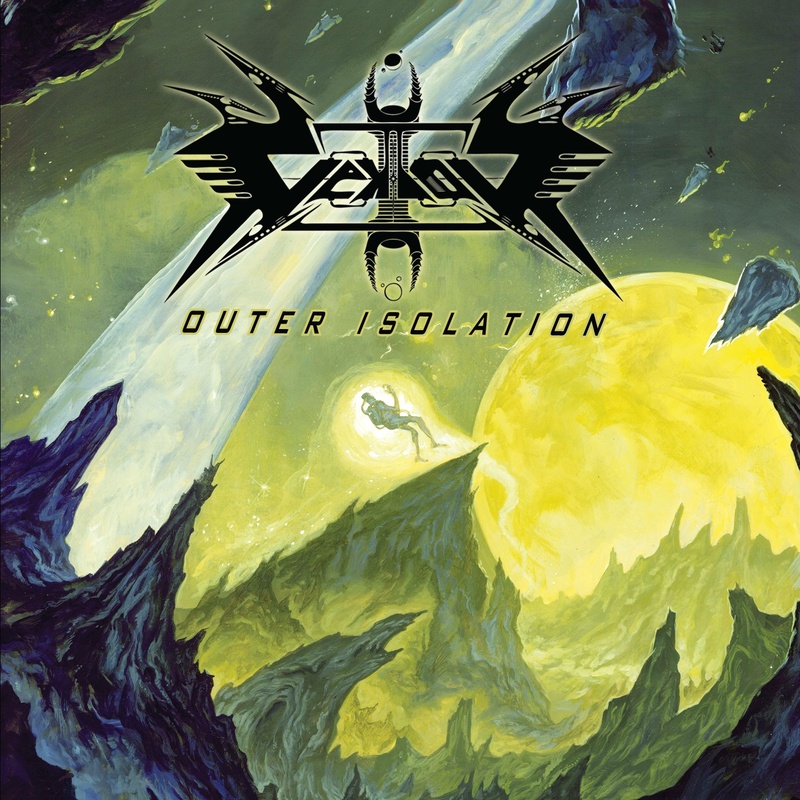 Vektor’s Thrash Metal is insane, full of technical madness, fast, furious, smart, epic, violent and also melodic. Just call it techno-thrash or progressive thrash. There are elements of prog’, black, death, symphonic Metal, can’t really say! 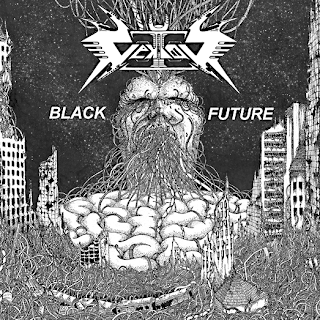 And Black Future also contained the awesome & typical fury of a band that’s releasing its first record. Needless to say that that record remained my favorite that year, and I still listen to it regularly. Now the second album has arrived, and the artwork is again fantastic albeit different from the previous one. This time it has colors and it’s not as dense. It’s rather open and “peaceful” in a way. Is this bad omen for the record? Is it going to contain less fury? Have Vektor gained some sort of sanity? Well, to figure that out, you’ll just have to listen to the epic 10+mins opener “Cosmic Cortex”. Yes, these guys are nuts enough to place the longest and most epic song at the beginning of the record. And guess what; it works! That is one hell of a killer track, with lots of variations, awesome riffs and melodies. It’s like the entire force of Vektor brought down to this song, with speed, madness and headbanging power. All doubts are now gone, and the rest of the record is all about freakin’ pleasure. Everyone will have it’s own favorite songs and features when it comes to Vektor. I personally mostly enjoy David Disanto’s singing. His screamed vocals sound like no other and that way he has of going heavy and acute is unbelievable. I also love the smart and groovy drumming, the insane bass lines and the crazy riffing. Yeah, I totally dig every bit of that band. Now that is the Thrash Metal Dream Team! What’s also really cool with Vektor is that no matter how complex some songs might be, they still are easily memorized, and something special makes you want to listen to them again, and again… Those damn “listening layers” at their best. You can just enjoy the thrash riffing and headbang or listen carefully to distinguish the smart songwriting. I already have some favorite songs on that one, like the INSANE “Tetrastructural Minds” (What the hell is that??). Just love the guitars on this one! And the opening scream is memorable! Again that track is so complex and somehow, you just want to sing along: amazing! I also love other songs like “Venus Project” and the very strange “Fast Paced Society”. But you know, the more I listen to it, the more I appreciate the songs differently…. Bottom line is, this album RULES, and the first Vektor record was definetly no accident. This band is one of the best things that’s happened to Thrash Metal over the past 10 years. Yeah, you can quote this one. I already wrote that when the first record came out, and I’m glad these insane dudes from Arizona proved me right with Outer Isolation!